MOCOW, July 5. /TASS/. Russia’s Uralvagonzavod (UVZ) corporation will supply 73 of its T-90S/SK tanks to Iraq and 64 - to Vietnam this year, the corporation said in the 2016 report published on Tuesday. The report identifies foreign contracts among its priorities, noting, among others "a contract with Contractor 368 to deliver the first batch of T-90S/SK tanks" and "the implementation of a contract with Contractor 704 to deliver 64 T-90S/SK tanks." Under the Russian state standard of national codes, number 368 is assigned to Iraq and number 704 - to Vietnam. T-90S is an export variant of the Russian-made T-90 third-generation main battle tank. 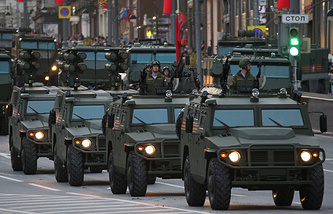 It features powerful weaponry, modern fire control system, combined steel and composite armor and high maneuverability. It is capable of fighting in all weather, round the clock and in any climate. The T-90SK main battle tank is designed to provide unit control and communication with command posts and to act in unit formations.